Enjoy a race like no other! The Petra Desert Marathon is a challenging adventure marathon set in the beautiful desert region of Jordan. 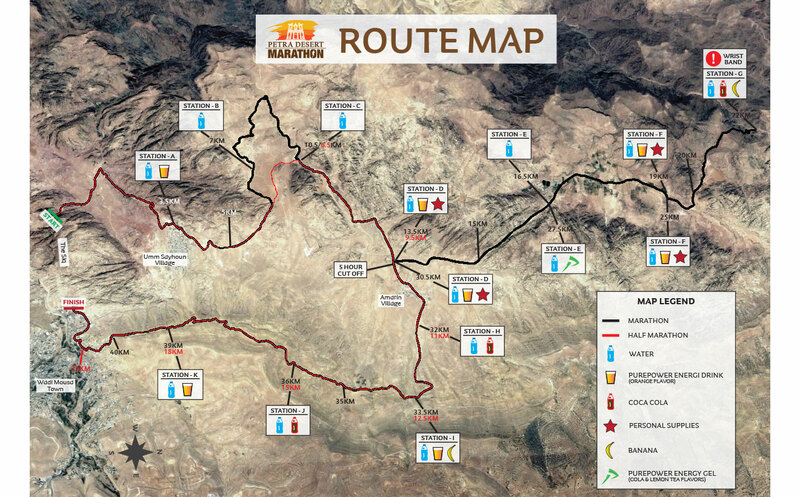 Starting in the ancient city of Petra, the route takes runners on a remarkable race in the area surrounding Petra. From the lunar-like mountain landscape to the arid desert, runners navigate challenging terrain in the dry desert heat. We offer a four night package, which includes your hotel accommodations, English speaking guide and a three-day entry to Petra. In addition, you have the option to extend your trip for three nights on the Adventure Extension in Wadi Rum (UNESCO World Heritage site), Dana Valley, as well as the capital city of Amman OR on the Cultural Extension with visits to Madaba, Mount Nebo, As-Salt, Amman, and Jerash. In Jordan you will find delicious cuisine, which is based on traditional Mediterranean and Middle Eastern influences; be able to explore historical sites; and enjoy the warm hospitality of the Jordanians. This was one of the best adventure tours I have traveled. Marathon tours has a gem in Scott Guillemette as he is a true cheerleader in all things. He is there for the client from the start to finish, he works at communication of the schedule more than once, and he follows up. We book with Marathon Tours because of Scott, even though we have ties to Albatros. Thanks Scotty G... for another great adventure. Scott does an amazing job to push the quality of service from the Marathon Tours higher. He is always working, always accessible and has no reservations to clear the way. Scott will listen, and deliver a solution. Even when Albatros delivers slightly under expectations, Scott really tries to make his clients wishes and concerns heard and resolved.